This time we had 3 participants: Gameg1, Cheatastcg, and myself. We saw many different strategies being played in this tournament: Orange boarding, Yellow-Green swarm, Red-Violet robots, and Vioilet-Yellow control. Aside from some minor problems with the audio, it went very smoothly! The event was commentated by Leandro Tokarevski, the creator of the game, who served as a judge for the different matches playing. 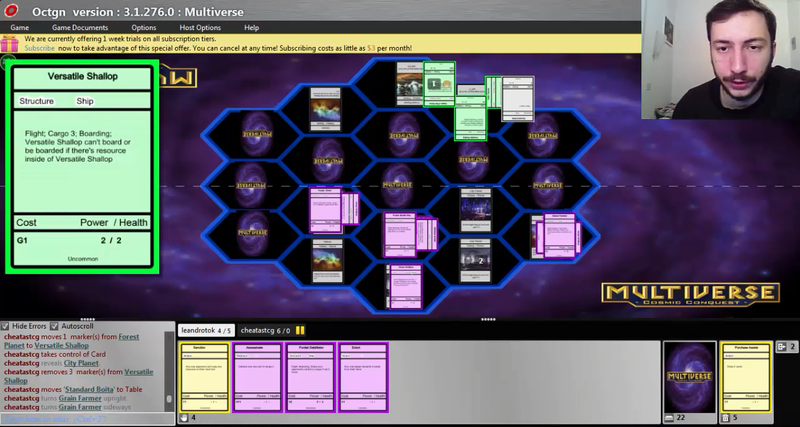 The tournament was held on OCTGN, which is a virtual tabletop simulator, in which you can play a variety of different board and card games. It's the perfect place to playtest the game without having to code the rules of the game. Players just keep track of the rules, just like in real life tabletop games. This time we had 3 participants: Gameg1, Cheatastcg, and myself. We saw many different strategies being played in this tournament: Orange boarding, Yellow-Green swarm, Red-Violet robots, and Vioilet-Yellow control.